As your manufacturing business takes its first steps into digital marketing, you’ve probably read about a lot of different marketing tactics that all seem to be complete necessities. “Why Your Business Needs to Be on Social Media” “How Email Marketing Can Earn You Millions Every Year” “Insert New Digital Marketing Tactic and Insert Why You Absolutely Must Start It Now!” But be careful not to believe everything you read; this is a bad trap to fall into. Focusing on too many marketing tactics and channels is a sure way to fail at them all. That’s why this year 35% of manufacturing marketers are discontinuing specific marketing activities they’ve found to be ineffective so they can concentrate on those that yield the best results. So how do you choose the right marketing tactics for your manufacturing business? Focusing on the wrong mix of blogs, YouTube, email marketing, and hundreds of social networks limits your ability to reach your audience. Luckily, there are specific steps you can take to analyze your audience and your market to determine the best marketing channels for your specific brand. Note: All statistics referenced in this blog are taken from Content Marketing Institute’s 2018 Manufacturing Content Marketing report. Create Buyer Personas: Determine 2-3 of your ideal buyers and create profiles – also known as buyer personas – that list everything about them. Where do they live and what is their education level? What are their main concerns and why would they need your product? Be as specific as possible. Learn How Your Audience Gets Information: Once you have your ideal buyer personas, how do they get information and engage online? Use customer surveys, social media demographics and study industry publications to learn what formats your audience most consumes and where they go for answers to questions. This could mean your ideal audience Google’s their questions and turns to YouTube videos for information or maybe they send out a question on Facebook and prefer to consume content through their email. Brand Awareness: You want your marketing to get the name of your business out there to establish you as an authority in your industry and a top tier choice for your solution. Lead Generation: You want to collect names and contact information of potential customers, strategic partnerships or other valuable leads. Direct Sales: Your website is set up to immediately drive sales through ecommerce or an order form. The biggest mistake most manufacturing marketers make is to say yes to all three of these goals. The next mistake is to set a goal but not set any clear metrics for measuring the success of that goal. Set one specific goal and set S.M.A.R.T. metrics to help you tie the accomplishment of that goal with your new digital marketing tactics. Aside from a lack of focus, your available budget and resources are another big reason not to spread your marketing across too many different tactics and channels. Before choosing which digital marketing tactics your business will focus on, determine what resources you have available to you. When you start, the percent of your overall marketing budget devoted to digital marketing will probably be relatively low and the marketing materials you have available to leverage may be few. For marketing talent, if your existing team is more experienced in traditional marketing tactics you may need to hire additional talent or look towards a digital marketing agency to help you set a marketing strategy and execute. Content Marketing: Creating blogs, videos, guides and other content can be a great way to establish brand awareness for your company and generate leads. Email Marketing: There are many different tactics involved in email marketing to fit different goals. Outreach emails can help build awareness and drive sales while lead nurturing emails and customer follow-up emails can help you engage with potential customers and deepen your existing customer relationships. Social Media Marketing: Depending on your audience’s social media activity, choose 1-2 social networks to become extremely active on to build brand awareness and engage with your audience. Make sure you are using a good mix of helpful and promotional content. Paid Search Advertising: If your audience primarily uses Google or other search engines when searching for a solution, pay-per-click advertising can be a good strategy for specifically targeting your buyer personas and showing up in the right searches. Local Optimization: If your business is focused on a local demographic, marketing specific to that area through geotargeting, local online profiles and other local optimization can be a great way to penetrate that specific market. As you choose the first 2-3 marketing tactics your business will focus on, don’t feel too much pressure. While it is good to get these decisions right the first time, the work really begins after your selections are made. Make sure to constantly measure the success of your digital marketing tactics against the goals you set for your company to determine if you are seeing a positive ROI. Some of these tactics take time to see a return on, but if a digital marketing tactic is consistently showing a negative ROI, it is time to either revise or to consider focusing on a different way of engaging your audience. No matter what digital marketing tactics your manufacturing business chooses, make sure you are constantly returning to these points. Your audience’s needs and tastes are always changing, as are your company’s goals and resources. Take a deliberate approach to your digital marketing strategy, get started and then continuously measure and modify. Need help getting your marketing strategy started? 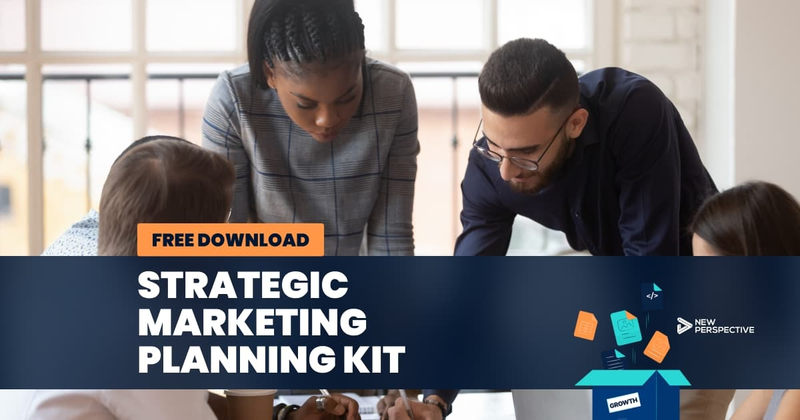 Download your free strategic planning kit. It includes everything you need to create a strong strategy that will get results.